Houses not properly configured may be hazardous to seniors. Simple retrofitting to senior-proof a house is an act of goodwill and a preventive charity to its residents. A long hall without handrails or anti-slip aids is not particularly friendly to the elderly, especially at night. One day the neighborhood chief of Renfu, Nangang District, Taipei, took Tzu Chi volunteers to Grandpa Zhao’s house. The visitors told Zhao that they had come to see if his home needed handrails installed for safety’s sake. “You’ve come at exactly the right time, just when I needed you,” Zhao said. “I just fell in my bathroom last week.” The fall had required several stitches on his forehead. Upon hearing about the accident, volunteer Chen Shu-hua (陳淑華) went to inspect the bathroom. Zhao followed her in. “I can’t stand up from the toilet without using a stick to prop me up,” Zhao said. He suffers from rheumatoid arthritis and has limited mobility. “Let’s install some handrails on the wall and by the wash basin,” Chen said. “They will make things easier for you.” She continued to inspect the bathroom. “You need to get in and out of the bathtub, so let’s install a handrail here too. What do you think?” Chen asked Zhao. Zhao cheerfully concurred. The volunteers also noticed that the hallway from the living room to the bedroom area was rather long and not well lit. They asked Zhao whether he wanted to put in brighter lights or have a long handrail installed in the hallway to make it safer at night. Zhao thought for a second and declined either upgrade, because he says he stays in his room most of the time at night. 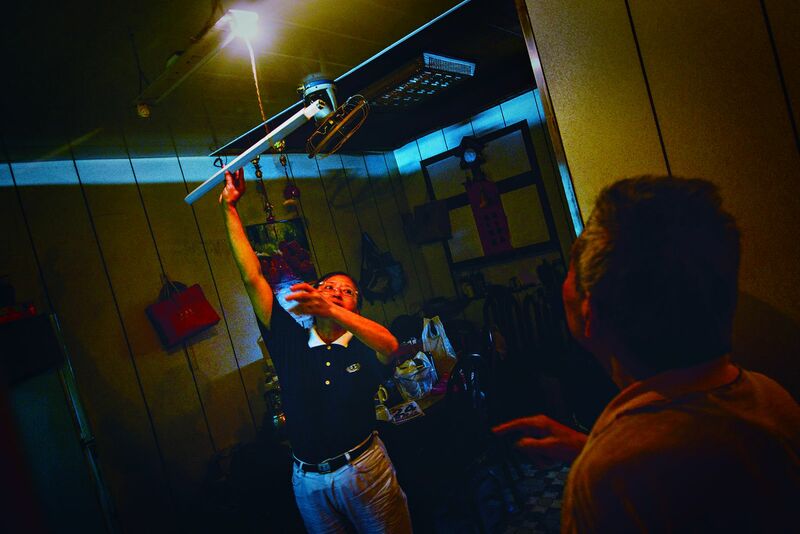 A volunteer checks the lighting while visiting the home of an elderly resident. 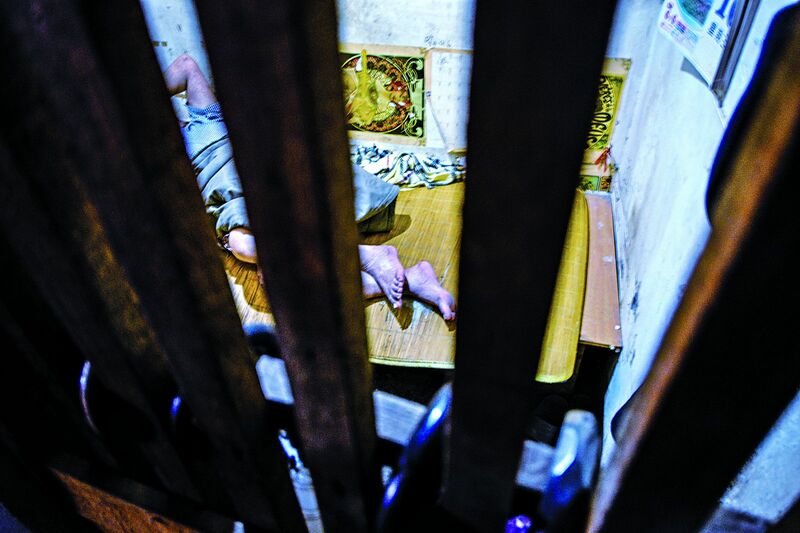 In 2015, the Nangang Health Center, part of the Taipei City Government Department of Health, asked for Tzu Chi’s help to make the homes of senior residents in Nangang safer. Volunteers had been regularly visiting 11 households of older people in the district, but the health center referred a hundred more families, bringing to 111 the total number of families that the volunteers needed to survey for senior-proofing services. Most of these homes had only one inhabitant. As a result of the volunteers’ home visits, 27 households had their homes senior-proofed. Of those, seven families paid for the safety upgrades themselves and 20 were fully subsidized by Tzu Chi. This was how Tzu Chi volunteers got the opportunity to work with Zhao. Zhao, 89, and his wife live in Taipei. Their two daughters live abroad with their own families. 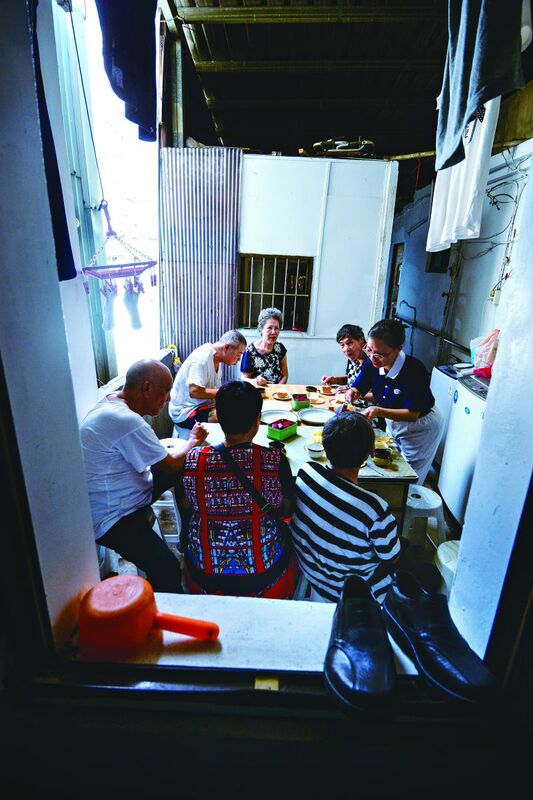 That made Zhao and his wife “seniors living alone” in the eyes of the Taipei City government. “Seniors living alone” is the official designation of people, at least 65 years old, whose co-inhabitants are unable to care for them and with whom no lineal descendants live. 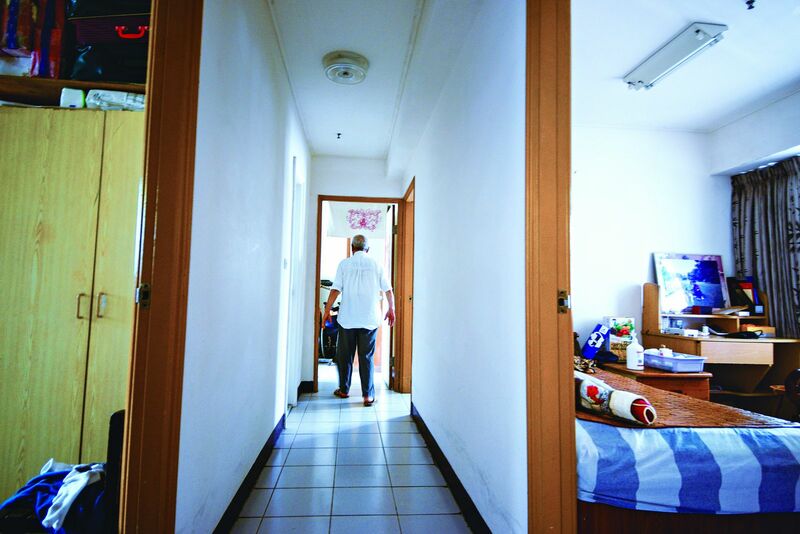 Since Zhao and his wife are considered seniors living alone, they were on the referral list that the Nangang Health Center gave to Tzu Chi for evaluation for senior proofing of residences. Zhao felt safer at home after the handrails were installed. He had wanted to have safety handrails installed for some time, but he didn’t know how to go about it. He was therefore grateful to the volunteers for their help in making him less afraid of another fall. 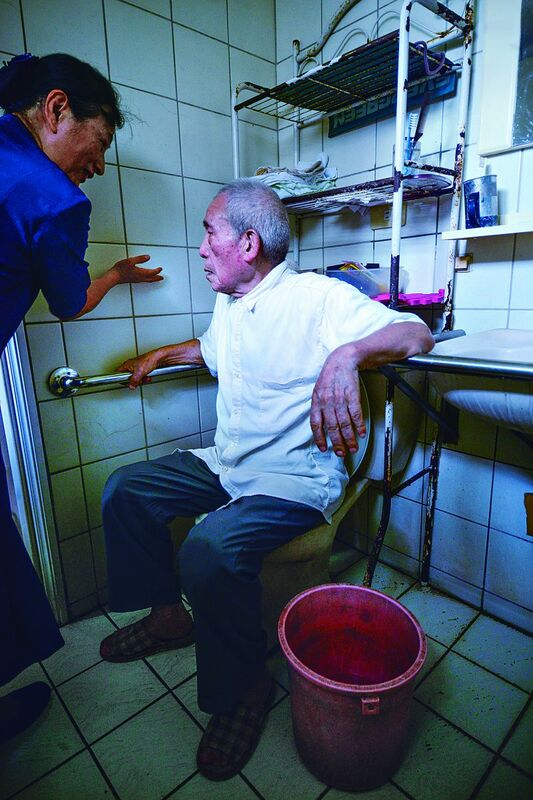 With his arms resting on handrails that Tzu Chi installed in his bathroom, Zhao tells a volunteer that he also needs a handrail that is higher for him to use when he stands to urinate. He and the volunteer discuss the height of the new handrail. Falls may not seem like a big deal for some people, but they are often a matter of life and death for seniors. Statistics from Taiwan’s Ministry of Health and Welfare put falls as the second leading cause of accidental death for seniors (people 65 of age or older) in Taiwan in the year 2015. One in five seniors had fallen before. Of this group, three in ten had been injured, and one in ten required hospitalization. Most public spaces in Taiwan, including those in public transportation, have been built or retrofitted to be friendly for seniors and the disabled. However, the same cannot be said of many homes. This makes the home a place where the danger of accidents lurks. Of the injuries that a fall may cause, a hip fracture is the most serious and hazardous. A hip fracture renders the patient immobile and bedridden, which over time weakens muscular strength, raises the risks of pneumonia and urinal tract infections, or otherwise leads the patient in a downward spiral of bodily health. A patient’s financial health is likewise impacted, as medical and other related expenses mount over time. The road of recovery for a hip fracture patient is long, during which expenses snowball. These include the costs of mobility aids, hired care providers, maybe even placement in a care facility. Such expenses are all long-term outlays that quickly add up and drain the financial resources of the patient and his or her family. In addition, the haunting experience of a fall may scare an older person so much that he or she avoids walking or getting out of the house for fear of another fall. This leads to less social interactions, which in turn may lead to seclusion and depression. What starts out as a bodily injury now evolves and snowballs to also impact the financial and mental health of the patient. It is therefore important to minimize the occurrence of falls for seniors, not the least of whom include seniors living alone. It was in eastern Taiwan that Tzu Chi first started improving the safety of homes for elderly people living alone. Later, Tzu Chi social workers in northern Taiwan noticed an uptick in injuries caused by falls among seniors whom Tzu Chi volunteers visited. They explored the issue, consulted Tzu Chi physicians, and in March 2013 started offering to install three safety items in the homes of seniors living alone: night lights, anti-slip mats, and non-slip stickers. Handrails and other safety aids are offered for the mobility-impaired as well. The volunteers have the best of intentions when they offer this service, and Tzu Chi foots the bill, but the actual installations have proved to be less than straightforward. They are undertaken only if the elderly give consent, but some seniors refuse to adopt the safety measures. They feel they can manage without the upgrades. Some seniors live in buildings that are so old and fragile that they cannot withstand the installation of the safety devices. In some cases, it is the landlords who won’t go along with the installation. An infirm older person, living in a rental that does not lend itself to easy movement, has been unable to tidy up his room, leaving stuff to collect dust. Most senior renters living alone in cities live in buildings with multiple floors. Going up and down the stairs can be a challenge for these older residents if there are no elevators. Accidents are more likely to happen on the stairs. Why don’t the seniors who live in walkups rent a friendlier place? It is often a matter of cost: Buildings with elevators often come with a higher rent. Grandpa Pan lived in an attic, accessible only by some steep, narrow stairways. He had fallen in the stairwell a few times. Tzu Chi volunteers urged him to move to the ground floor, but he refused. The rent for a place on the ground floor would be higher than what he was paying, and he was getting by on a small government pension, some allowance from his son, and a Tzu Chi grant. Tzu Chi promised to increase its grant if Pan would move downstairs, which finally persuaded him to move. Older people have long been discriminated against in the rental market. One survey pegged the percentage of landlords who did not want to rent to old people living alone at 90 percent. Facing such discrimination, older people with less means usually end up renting highly undesirable or even hazardous places. These places tend to be in older buildings in older neighborhoods. For example, a media report in 2016 highlighted one such building in the Datong District in Taipei. This 2.5-story building had been partitioned with wooden boards into living quarters for over 20 seniors living alone. They were not eligible for public nursing homes, and they were unable to afford private nursing facilities. Consequently, they ended up in a place that could be had on the cheap. Volunteer Chen Shun-chi (陳順池) has been helping disadvantaged seniors in the Datong District repair their homes for more than ten years. He pointed out that his tasks were rather straightforward in the early days, involving repairs for individual items like doors, windows, beds, or roofs. He and other volunteers sometimes helped seniors clean up their living quarters and surrounding areas too—all to give the elderly a sense of dignity. But the nature of his tasks has changed in recent years; his work has come to involve more comprehensive planning with a focus on safety. Whatever he does, however, Chen always carries out his projects as if he were doing them for his own family. With that, Chen observes, devises, and implements practical but beneficial improvements for the seniors. This building packed with more than 20 elderly residents was among the projects that Chen has worked on. “Right off the bat, I fixed eight doors,” he said. “Later, I installed handrails in bathrooms, hallways, and kitchens. Many floors were rather bumpy, so I smoothed them out. I also put in exhaust fans to improve air circulation.” Because of his efforts, the building became a more livable place for the seniors. Besides improving the living environment, volunteers regularly visit the residents. Volunteers Chen Li-ling (陳麗鈴) and Shi Xia-lan (施夏蘭) visit the elderly every month. They bring tea and snacks, and they chat with the old folks. Some-times they also have meals together. Volunteers will continue to attend to the needs of older people who live alone and to make their homes safer to live in to help them have a better old age. As Taiwan becomes an aging society, the welfare of older people is an issue that demands the dedication of more resources. 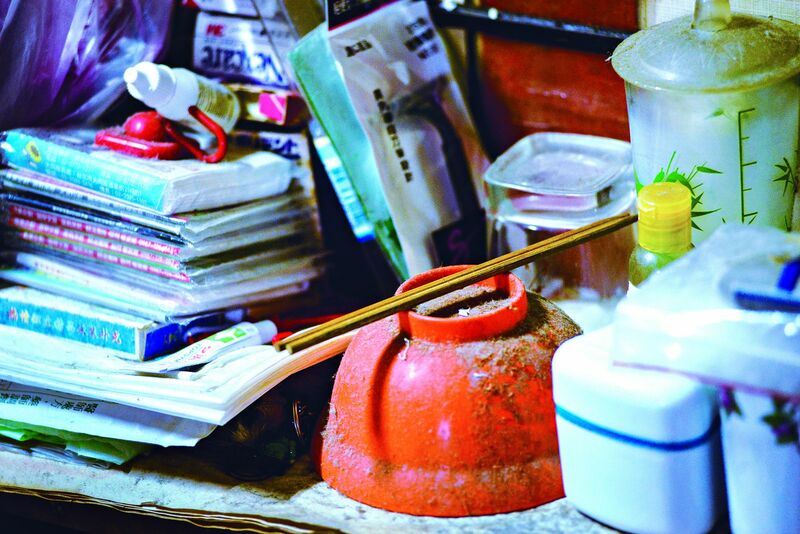 Volunteers regularly visit this place packed with more than 20 elderly residents in the Datong District, Taipei. Together they have tea and snacks and chat.